Gili Air Indonesia is quite new to my geographically challenged self. I knew for a fact that Indonesia is an archipelago and that it has almost three times more than the number of islands in the Philippines. But the Gili’s have never been introduced to my vocabulary not until my travel buddies mentioned it as a possible destination for the long weekend. On one long weekend, we are set to discover the Gili’s of Indonesia and first off is the Gili Air, the more relaxed and peaceful island as opposed to Gili Trawangan. 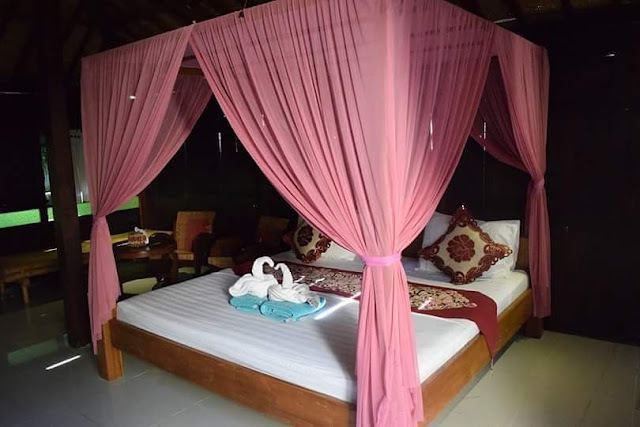 And we found the perfect representation of the island in the form of our accommodations – the Omah Gili Resort. Relaxed. Rejuvenating. Retreat. These words particularly summed up our stay at Omah Gili Resort. The islands’ restaurants, bars and other water sports activities are easily accessible from our booked accommodations. Though not directly at the beach front, a narrow alley of a few meters walk serves as our gateway to the beach and the restaurants aligned along the shores. There are two spacious rooms in the villa with interiors maintaining the traditional Indonesian architecture and aesthetics. A simple living room is set up in the center as well and the rooms are situated on both sides. The room is made from durable wood with traditional thatched roofs combined with modern western comforts. The ornaments are likewise custom-made wood. Each room comes with an en suite toilet with the shower area’s layout in open air. The shower itself is custom-made as well and is made of bamboo. With the fresh air and view of coconut trees, it felt like bathing under the rain fall in a more relaxed state. Quite interesting. The bedroom is elegantly designed equipped with the basic room amenities. I personally commend the hospitality service of the resort. From checking-in, checking-out and all concerns in between the duration of stay, it has been properly addressed and in an instant. Our happiness can get shallow at times. For instance, we were served with tamarind juice as complimentary welcome drinks upon check-in. It was so good that we wanted to order bags or sachets of it during our last breakfast at the island. Later on, we found out that it’s not the instant juice powder of tamarind flavor but rather fresh extract. The preparation is actually tedious as with the aid of a mortar and pestle, the tamarind is crushed. I am not so sure about the procedure but it goes something like that. Guests are advised to order in advance. Apart from having a friendly staff, they too can communicate at ease which makes the stay hassle-free and indeed accommodating.